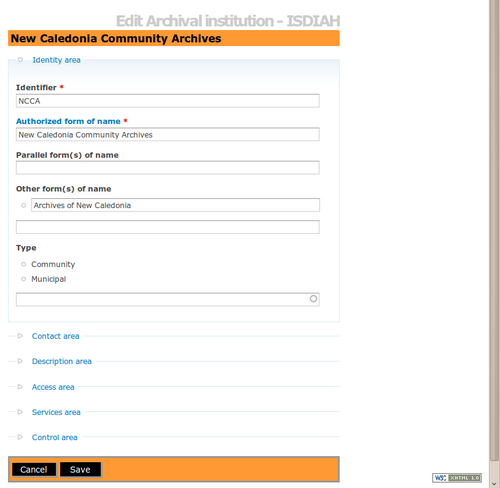 Navigate to the archival institution you want to edit. For more information on navigation in ICA-AtoM, see access content. Switch from view mode to edit mode by clicking the title bar or edit button; this takes you to the record's edit page. On loading, the edit page displays the record with all information areas closed; click on an information area to access the fields grouped under it. To discard all changes, click the "cancel" button in the button block; ICA-AtoM returns you to view mode with no changes saved. To save changes, click the "save" button in the button block; ICA-AtoM commits the changes and returns to the page to view mode. This page was last modified on 17 June 2010, at 17:40.